3D Wall Panels or Decorative Wall Panels create the exact feeling you want in your store. Choose Barn Wood textured wall panels if you want an earthy ambiance. Blocks makes any space warm, rustic, and earthy. Bricks 3D wall panels feels like coming home. Concrete or Cement textured wall panels gives your space an edgy, midtown look and feel. Corrugated Metal 3D wall panels provides a rustic yet edgy feeling. Diamond Plate wall panels speaks for itself - contemporary and tough! Heavy Metal 3D wall panels delivers a strong, urban feel. Slate panels says urban, chic. Subway Tile panels is clean, sleek, and shiny. Nothing beats Tire Tread 3D Wall Panels if you have automotive products or services. If you want to get your groove on you'll want to choose a Wave style. 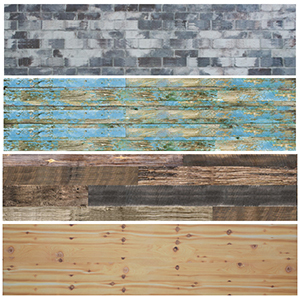 Choose "Weathered Wood" wall panels if you want cool, or warm and authentic. Weave 3D wall panels is perfect for small spaces that you want to look bigger. If you want to create the feeling of natural beauty and warmth, and want your customers to cozy right up to your merchandise, choose Wood. If you are looking for Textured Slatwall, click here. Note: All panels are made-to-order and ships in about 3 weeks, not including transit time. Rush services are available, check with your sales representative for details. Because these are made-to-order, there are no cancellations after the order has been confirmed.